(Bloomberg) -- There is at least one section of the U.K. that is rooting for Prime Minister Theresa May: currency traders. 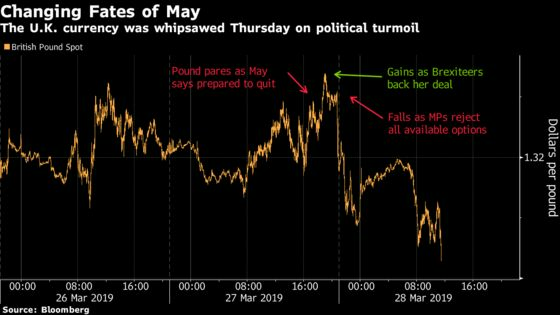 While lawmakers couldn’t agree on a single way forward when parliament met Wednesday, those trading the pound quietly delivered their verdict in favor of May staying at the helm: the currency pared gains on news that she would step down in return for a favorable vote on her deal and strengthened on suggestions that some Brexiteers would back her proposal. The currency market has shown a preference for stability at No. 10 Downing Street through the Brexit turbulence of recent months, with sterling falling when May’s position looked to be at risk and rallying as she survived a no-confidence vote. It’s not unusual for investors to favor the certainty of an incumbent leader to an election, but in the U.K., it also comes down to what the alternatives are, according to Nomura International Plc. The pound would slide as much as 3 percent if an election was called, and could fall as much as 8 percent on a victory for the opposition Labour Party, he said. Sterling has fallen this week but is still the best Group-of-10 performer so far this year.